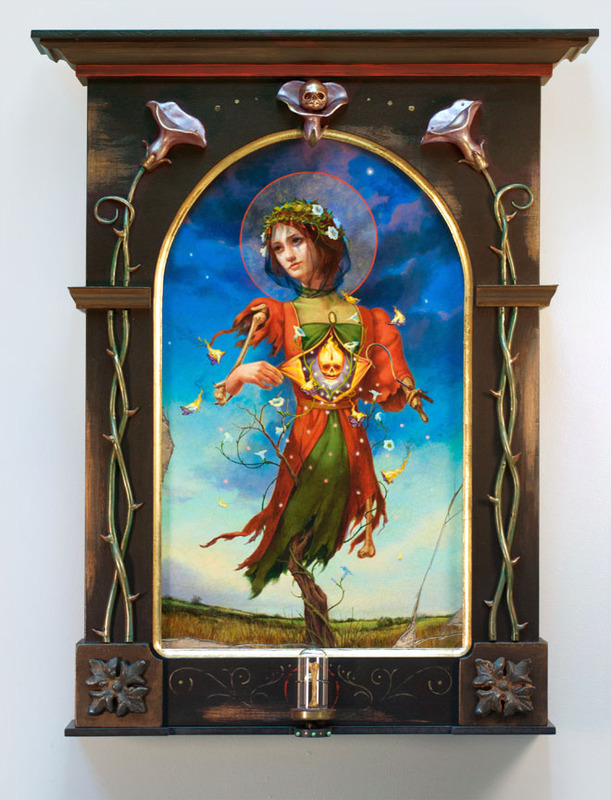 Reliquary of the Morning Star 23x18.5x5” acrylic on panel, wood and mdf frame with polymer clay and cast metal ornaments, composition gold leaf, metallic and iridescent paint, glass dome, brass. My latest reliquary piece evolved from the series of scarecrow drawings I’ve been working on, or maybe they were generated by thoughts about this piece, which I’ve been mulling over for awhile now. 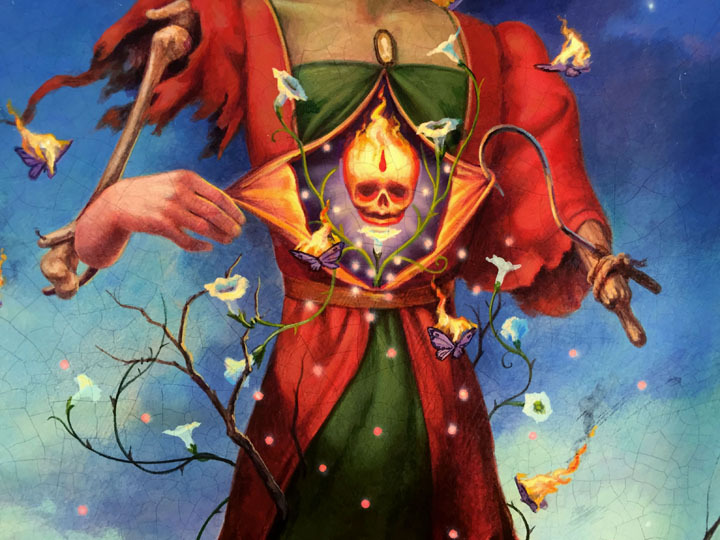 The work ties in a bunch of elements from my drawings and paintings including the sculpted thorny vines, small skull, flaming butterflies and of course moonflowers. 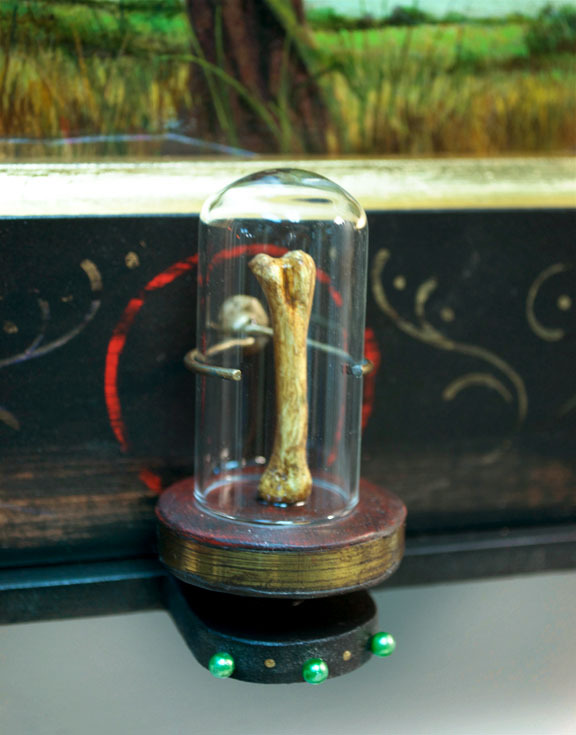 A small glass dome holds the reliquary’s artifact, in this case a fully intact bone. It was a bit trickier to create than the resin filled inserts I’ve done previously but I like the added dimension for this particular piece. The glass and bone sit on a pad made from polymer clay molded inside an old brass lock ring that I scavenged from a jar of odd hardware pieces squirreled away in the basement. I’ve done different types of halos around my reliquary and painted figures over the years, this one is painted with an iridescent gold. I think the shimmering, now you see it now you don’t characteristic is a nice fit. The painting has been finished using a special craquelure varnish and I’ve worked in a few trompe o’leil breaks as well. 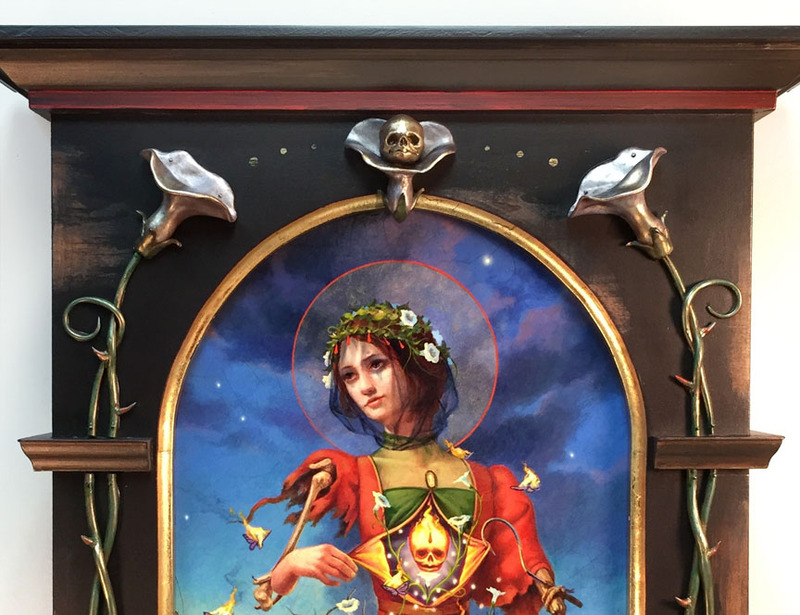 “Reliquary of the Morning Star” is available directly from my studio. For more information or to inquire about purchase please email me using the Contact form here. The vines running up the sides carry through the horizontal molding to the top of the piece opening into a moonflower. Hard to capture the look with a photo, but the flowers have been painted using a multi step process involving both iridescent and metallic paints applied in layers and wiped back. The vines have brushes of iridescent gold applied as well. Easy to see the craquelure finish on this close in shot of the mid section of the painted panel. 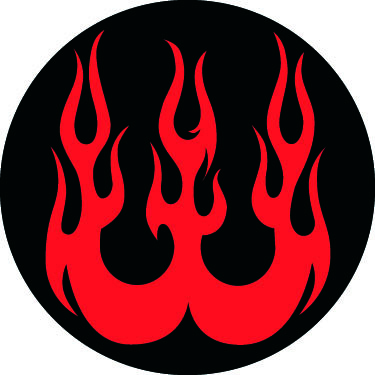 Moonflowers, flaming butterflies, glowing spots all seemingly conducted by the central small skull. 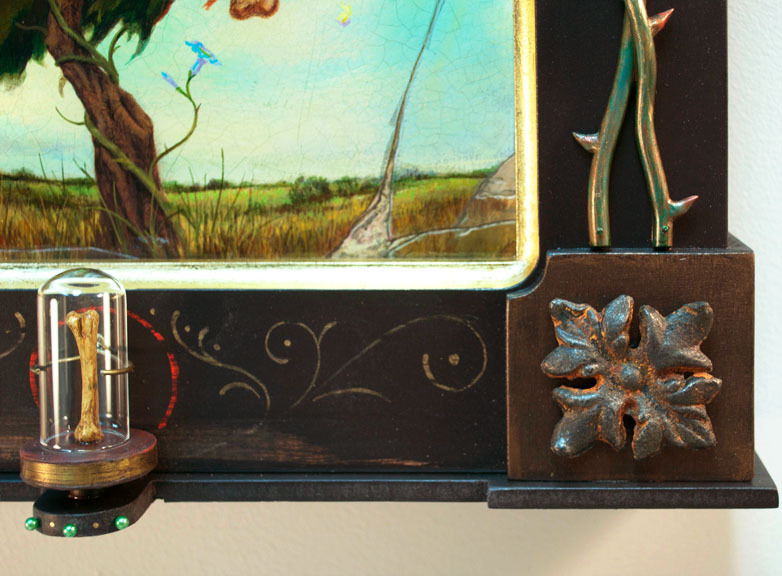 These reliquaries were all conceived as work of a long lost civilization. I wonder what the archeological world will make of their symbolism. Detail of the bottom edge of the piece and the small bone the reliquary enshrines.